Always in style, brick, gables, and a traditional hip roof combine with an arched entry and beautiful, arched windows for a truly elegant home. The interior offers an abundance of luxury with dramatic spaces, tray ceilings, built-ins, and a lovely picture window with arched top in the dining room. Custom details abound. Note the wet bar, large, walk-in pantry, oversized laundry room with sink and cupboards, and three car garage. A large walk-up attic and a partial basement create added space for storage. His and her baths highlight the master suite, and each has its own walk-in closet. Two family bedrooms share a well-equipped bath, while a fourth bedroom makes a great guest room with private bath. 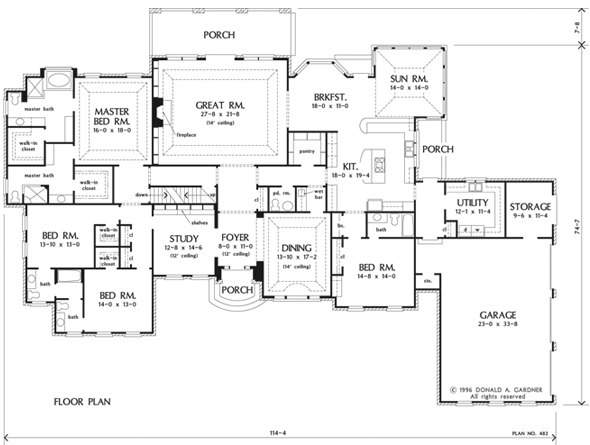 1st Floor: 4523 Sq. 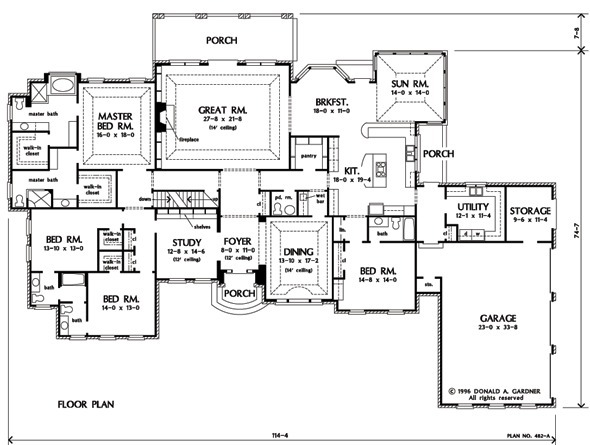 Ft.
House Dimensions: 114' 4" x 82' 3"
Great Room: 27' 8" x 21' 8"
Master Bedroom: 16' 0" x 18' 0"
Garage Storage : 9' 6" x 11' 4" x 0' 0"
Other : 5' 6" x 6' 6" x 9' 0"
Other #2 : 5' 8" x 6' 8" x 9' 0"
Foyer (Flat): 8' 0" x 11' 0" x 12' 0"
Dining Room (Tray): 13' 10" x 17' 2" x 14' 4"
Other #3 (Tray): 14' 0" x 14' 0" x 11' 6"
Great Room (Tray): 27' 8" x 21' 8" x 13' 4"
Kitchen : 18' 0" x 19' 4" x 9' 0"
Breakfast Room : 18' 0" x 11' 0" x 9' 0"
Utility Room : 12' 1" x 11' 4" x 9' 0"
Garage : 23' 0" x 33' 8" x 0' 0"
Master Bedroom (Tray): 16' 0" x 18' 0" x 11' 0"
Bedroom #2 : 13' 10" x 13' 0" x 9' 0"
Bedroom #3 : 14' 8" x 14' 0" x 9' 0"
Porch - Front : 6' 7" x 6' 8" x 0' 0"
Porch - Rear : 29' 2" x 9' 10" x 0' 0"
Porch - Right : 4' 11" x 12' 6" x 0' 0"
Media Room : 12' 8" x 14' 6" x 12' 0"
Storage (Other) : 4' 11" x 2' 10" x 0' 0"
Other #4 : 6' 0" x 5' 0" x 9' 0"